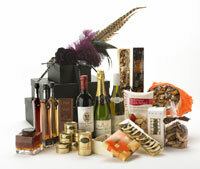 Sophistication and sublime taste is the hall mark of an Inhouse hamper. From the moment the smart black boxes replete with silk ribbon and lush festive decoration is received the recipient can indulge in a complete sensory experience. Each item in our hampers is individually sourced from around the world for people who love good food and award winning wines. We are delighted to be able to offer gourmet foods and wines to what is an increasingly discerning kosher customer base. 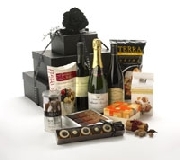 We have sourced the finest kosher delicacies from around the world as well as here in the UK, to ensure all recipients are delighted by the range, high quality and sumptuousness of each hamper. Each item of food and drink is certified kosher. On the gift tag we can include the name and short message for the recipient.